In the bookshops and cafes of present-day Paris, ex-psychologist Gabe Figaret is trying to put his shattered life back together. When another doctor, Reynard, asks him to help with a delusional female patient, Gabe is reluctant… until he meets her. At first Gabe thinks the woman, Angelina, is merely terrified of Reynard, but he quickly discovers she is not quite what she seems. As his relationship with Angelina deepens, Gabe’s life in Paris becomes increasingly unstable. He senses a presence watching and following every move he makes, and yet he finds Angelina increasingly irresistible. When Angelina tells Gabe he must kill her and flee to a place she calls Morgravia, he is horrified. But then Angelina shows him that the cathedral he has dreamt about since childhood is real and exists in Morgravia. Soon, Gabe’s world will be turned upside down, and he will learn shocking truths about who he is . . . and who he can – or cannot – trust. Gabe is living in Paris after running away from the ruin of his life in England. One day, a customer at the bookshop where he works asks him to see a young girl as a patient, but Gabe insists that has given up his career as a psychologist. Reynard is not to be deterred though, and when Gabe finally meets Angelina, he is drawn to her in a most disturbing way. Meanwhile, in Morgravia, the reclusive monk Cassien is drawn out of his forest home and tasked with protecting Queen Florentyna from a mysterious demon, due to return to their world and bent on the destruction of the entire kingdom. In his travels he runs into the youth Hamelyn. The stories of the three men are intertwined throughout this story, as each must come to terms with their own magic and work together to locate and destroy the demon threatening the world. The Scrivener’s Tale is a return to the world Fiona McIntosh first wrote about in her Quickening series, set several hundred years later. When I first heard about this book and realised it was a stand-alone story in a previously created world, I was assured that I didn’t need to read the previous series to know what was going on. This is true to a certain extent – there is quite a lot of story set-up at the start to help the reader to understand the history of Morgravia and the magic of Myrren and Wyl Thirsk (who, I understand, the Quickening is about). I did feel, however, that because this world has been written about before, I didn’t get a chance to explore the settings and really get much of a feel for the place. Instead I was given a set of locations – the Forest, the Wild, the city of Pearlis – without really getting any description of what they are like. The slight lack of atmosphere was made up for by the characters – each of them are unique and endearing, and I especially liked Queen Florentyna and the kind way she rules Morgravia. Gabe brings a certain “down-to-Earth” nature to the story, but after the first few chapters where he features heavily we really don’t hear that much more from him. The way the cover blurb is written it sounds like the whole story is centred on Gabe, and I’ll admit I was disappointed by the fact that it really wasn’t. It was great to hear his confusion over ending up in a new world and I would have liked to read a bit more of that. I’ve read a few reviews of this book describing it as having “non-stop action”. While there are exciting and action-packed parts, on the whole the story is fairly slow-moving and took me quite a while to read – it just didn’t grab me for some reason. Despite that, I felt it was very well written and I’d like to look into some of Fiona’s other works – perhaps her historical fiction. She certainly has a variety of genres on her shelf! The Scrivener’s Tale is a well-told stand-alone story. I think I would still enjoy reading the earlier series, starting with Myrren’s Gift – not too much of the earlier story is given away in this one. Those that have already read the Quickening series should enjoy this return to Morgravia. 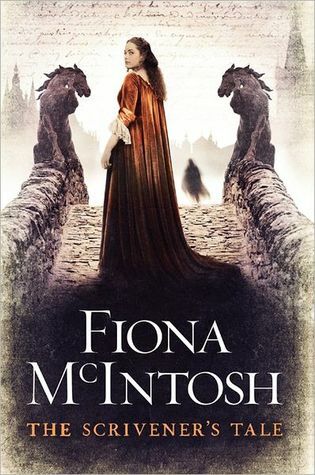 Fiona McIntosh writes best selling historical adventure-romance alongside the heroic-romantic, often brutal, fantasy she built her career upon. She lives in Australia but frequently roams the world meticulously researching the locations and gathering material for her historical novels that have international settings. Her books are published worldwide and in various languages. 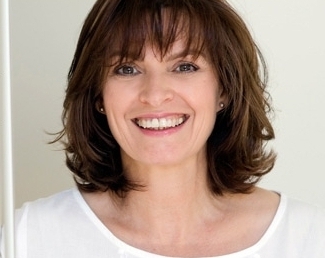 Her most recent historical fiction The Lavender Keeper has gathered such a following that she is now hosting a tour in 2014 to Paris and Provence so eager readers can walk in the footsteps of her characters. I have not heard of the author or her previous series before. Until recently, I rarely read any Adult Fic, but I have started slowly reading more and more and I have enjoyed most immensely. This sounds like another good one to add to my list. And a bonus, the cover is gorgeous! I really liked this, I have also read her historical fiction ( the lavender keeper & the French promise) and I have the first two books in her crime fiction series on my shelf, unread though. I’ve read one of her trilogy though not Quickening and I’ve enjoyed one of her historical fiction too.